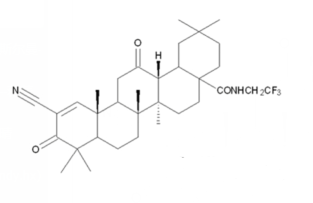 Eriodictyol is a flavonoid isolated from the Chinese herb, with antioxidant and anti-inflammatory activity. Pyridoxine is a pyridine derivative. Danshensu, a herbal preparation used in traditional Chinese medicine, possesses potential antitumor and anti‑angiogenesis effects. Ezetimibe is a Niemann-Pick C1-like1 (NPC1L1) inhibitor, and is a potent Nrf2 activator. Ezetimibe (Eze) is a potent cholesterol absorption inhibitor.